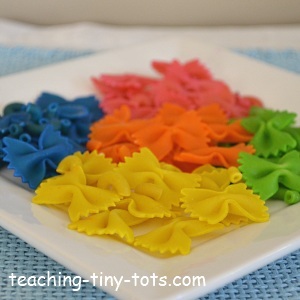 Toddler Math: Making Colored Pasta! 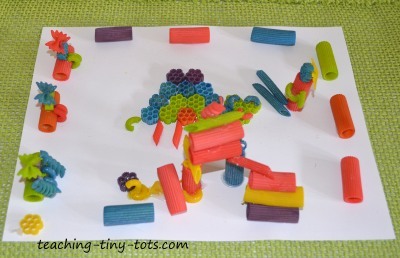 Toddler Math: Hands on Fun with Colored Pasta. Learn simple math concepts through play! 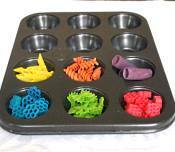 Make brightly colored pasta for hands on toddler math activities that will reinforce counting, recognizing numbers, number representation, sorting and learning about patterns. Gloves are recommended for adults and art smock or old shirt for child. It will stain clothes. Place one cup of pasta in a ziplock bag. Mix types of pasta or make each type a different color. Put 1 Tablespoon of Alcohol in small container and drop 8-10 drops of food color into alcohol. Mix with coffee stir or the teaspoon. Pour into ziplock bag and zip close securely. Shake gently and turn bag over a few times to spread color. Let sit on a paper towel for about 10 min, turn bag over and let sit another 10 minutes. For deeper color add another 10 minutes. Do not leave in bags for several hours. Place waxed paper on cookie sheet. Open ziplock and carefully pour out the colored macaroni, spread out in single layer for faster drying and discard bag. 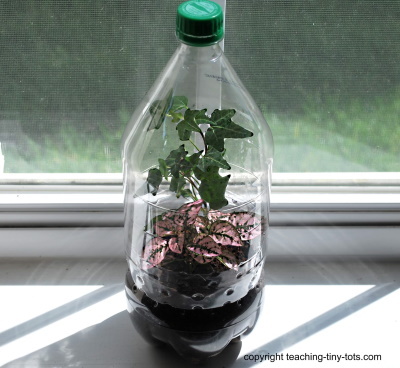 Let dry thoroughly before putting into container or bag for storage. Double the alcohol/food coloring if putting two cups into the ziplock. We tried both the regular shades and the neon shades of food coloring. Remember that pasta has a base yellow color which will slightly affect the end result but you still can achieve bright results especially with the neon colors. We tried a few of the combinations on the back of the food color box to get other colors by combining a certain amount of drops per color like turquoise, and sky blue. If your child is a vigorous shaker, you might want to use quart size freezer bags, since they are stronger. We did have one regular lunch size ziplock tear at the top despite careful shaking. There are many variations on the recipe. 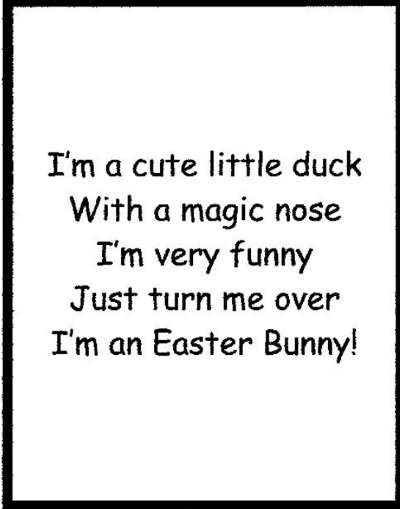 I read about four different versions and went with a middle version. The more alcohol you put, the longer it will take to dry. Note: Once the pasta is dyed, it is no longer edible! Use only for toddler math or craft activities. For young toddlers, please monitor carefully. Mix a handful of pasta together and put in a small tray like a meat tray. Have your child sort into muffin tins either by color or by type of pasta. 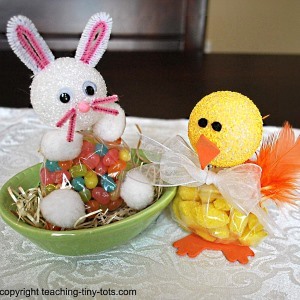 For young toddlers sort by color and pick only two or three colors to work with. Lay out a dish towel or work at small table. Make simple patterns with the pasta: AB AB AB AB or ABC ABC ABC. If your child is successful with that try more challenging patterns like ABBA ABBA ABBA. If your child is having difficulty, you might draw circles on a sheet of paper, color the circles with crayon to make a pattern first and then have your child match the color with the colored pasta. Line up a row of pasta. 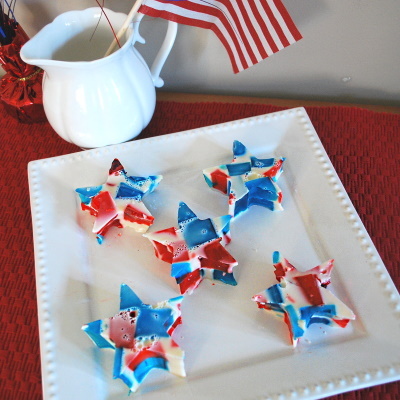 For beginner counters, line up 2-5 pieces until they are successful. Have your child point and count. This will help develop one to one correspondence and will help teach your child to count in an orderly fashion. Many children will count objects randomly and it's difficult to track which ones were counted already. Depending on your child's proficiency, select 1-6 muffin liners to use. Start with one or two muffin liners, choosing lower numbers. Have your child place the correct number of pasta in each cup. When your child is finished, take out one cup at a time, line up the pasta and count. Even if your child is incorrect, always use positive reinforcement, and say, "That was an excellent try." You want to encourage your child to continue playing. Choose only one or two toddler math activities per day. Keep the time appropriate for age and your child's ability to focus. Your child's ability to focus will lengthen with repeated practice doing similar activities. This is a wonderful age to start toddler math activities because children view everything as a game. Other Activities Using Colored Pasta! 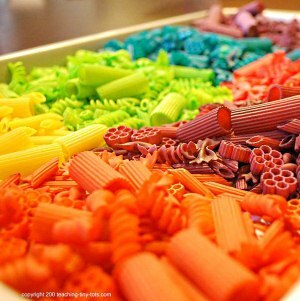 in our Activity section for more ways to have fun with colored pasta. This pasta keeps well in a cool dry place in ziplocks. This picture was created a couple years later so you can make large batches at one time! The reason counting activities are very important is because it helps to develop the three aspects of numbers. Understanding how much is 3 and being able to show or give three items.